The Indian smartphone market has been seeing unprecedented traction for the last couple of years. The industry is being driven by multiple factors including decrease in handset prices – both of smartphones and feature phones, ultra-low cost of data, plethora of choices and varied drivers of data consumption. And 2017 was no different. India bought a total of 287 million mobile phones during the year, including 164 million feature phones and 124 million smartphones showing a growth of 57% and 43%, respectively in each category. In 2017, the market witnessed a boom with mobile companies making a kill in the third- largest smartphone market of the world. The plate was full for all the serious players – from domestic manufacturers like Reliance Jio to global giants like Samsung and Xiaomi. In 2017 alone, the country’s overall smartphone market registered 14% annual growth with a total shipment of 124 million units, the International Data Corporation’s (IDC) Quarterly Mobile Phone Tracker says. The current growth numbers make India one of the fastest- growing markets amongst the top 20 smartphone markets globally. In the third quarter of 2017, smartphone market grew 37% (quarter-on-quarter) and 18% (year-on-year), temporarily surpassing the US for the first time ever. According to the latest research from Counterpoint’s “Market Monitor Service”, India’s handset shipments reached an all-time high of over 84 million for the first time ever, driven by the strong sale of both feature phones and smartphones. 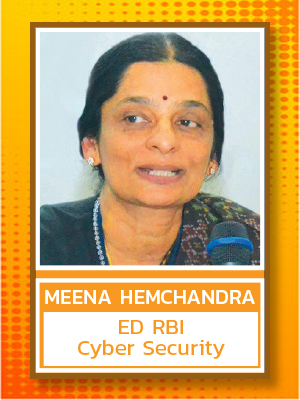 IDC report says a slowdown was witnessed in the market in late 2016, partly due to demonetization initiative launched by the Modi government and the scarcity of mobile phone components. However, the market regained momentum and achieved double-digit growth in 2017 with a record 56 million feature phone units shipped in the last quarter of 2017 alone. On the global front, the world’s largest smartphone market, China saw its first decline this year, while the USA was relatively flat, says the IDC report. In the third quarter of 2017, Chinese brands performance remained strong and contributed to more than half of the total smartphone shipments. It is the third consecutive quarter when their market share is well over 50% after they took over local players in the second half of 2016. However, local brands like Micromax and Lava grew 41% and 24% (QoQ), respectively, in the smartphone segment recovering from their all-time low during demonetization last year. 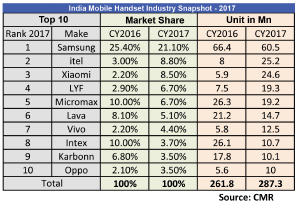 The smartphone market in India has changed dramatically in the past 6–7 quarters, if you look at the table attached, except for Samsung none of the top brands that featured in the top 5 till the third quarter of 2016 feature in the list anymore. In fact, most of these brands are not even in the top 10 reckoning anymore. Recent entrants like Xiaomi, Oppo, Vivo and the re-entry of Motorola have taken the wind out of their sails. Is there a slowdown in the offing? According to a recent report by Gartner Inc, the number of feature phone users moving to smartphones has slowed. Also, people are extending the life of their smartphones by owning them for longer durations. According to data generated by Gartner Inc., global sales of smartphones to end-users totalled nearly 408 million units in the fourth quarter of 2017, a 5.6% decline over the fourth quarter of 2016. This is the first year-on-year decline since Gartner started tracking the global smartphone market in 2004. While this is a worldwide data, Indian market situation is very different. India is expected to continue to grow at a fast pace in the near future as people will continue to migrate to smartphone, primarily to take advantage of 4G network, which is not just faster but also cheaper. While the smartphone trend is expected to remain the same for the next fiscal year, feature phones with 4G connectivity might steal the thunder. China-based vendors having presence in India have further strengthened their positions in 2017. In the smartphone category, the collective share of China-based vendors reached 53% in 2017 from 34% a year ago. The rest is shared between global big players like Samsung, Apple, Asus and Indian players like Micromax, Lava, Intex, Karbonn and all others. Chinese smartphone maker Xiaomi registered an incredible performance in 2017, and its market share grew by nearly two-fold in Q3 2017. The company grabbed the top spot from Samsung in the Q4 of 2017. Xiaomi, whose market share in Q4 2017 grew to 26.8%, tripled its shipments on a YoY basis and sold more than 2 million units from its offline channel. Xiaomi has expanded itself by foraying into offline Mi stores. Samsung, which slipped to second position in the smartphone ranking in the last quarter of the year, retains the top spot in the overall year. To further cement its position in India, Xiaomi has announced that it will invest Rs.7,000 crore in the Indian startup ecosystem to create a local ecosystem for itself and also to gain better local insights. 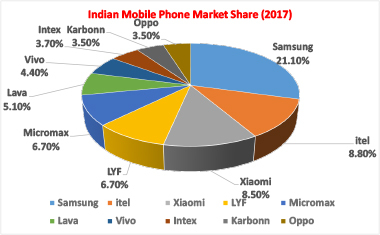 Vivo, which is another Chinese brand, is currently positioned at the third spot in terms of market share in the Indian smartphone market with different market research firms giving it anything between 6% and 8% market share in their reports. Vivo in Q4 2017 has a 10% market share and is followed by Oppo with 8% and Lenovo with 7% market share. This growth in its market share has been mainly due to the sales of its phones in the below- Rs.15,000 market. However Vivo is now in the process of lifting its brand image – from a mid-segment smartphone player to a premium one, which is reflected in the products that they are trying to push in the market, distribution strategy, etc. It tasted success in the Vivo V7+ smartphone launched last year which was positioned in the below-Rs.20,000-Rs.25,000 price segment. It has recently appointed Amir Khan as its brand ambassador replacing Ranveer Singh which experts believe is an indication that the brand will target slightly premium segment with slightly older audience in mind. The recent launch of Vivo V9 and the expected launch of phones are based on the APEX concept that it showcased during MWC. Lenovo follows dual brand strategy in India with phones selling under both Motorola and Lenovo brands. Jointly, these brands control 6% to 8% market in India and the major chunk of sales comes from the Motorola brand. Motorola is continuing to strengthen its offline retail presence in India with the launch of 100 new Moto Hub outlets in the state of Karnataka and 50 Hubs in the city of Mumbai and multiple outlets in Delhi NCR and KolKata. It is targeting a third of its sales from its organized outlets. Besides, large-format stores and mall hubs, the handset giant has plans to open 1,000 such stores across 100 cities by this year. Motorola has been very successful in its online sales and not with offline retail network getting strengthened, it can look at faster sales growth in the coming quarters, since 70% of smartphone sales still happen through offline channels. Oppo is the sister brand of Vivo and is the fifth-biggest smartphone seller in India at end-December with 5% market share. It sells the bulk of its phones via company-owned and partner retail outlets of the company. But of late it has started to cut down heavily on its retail network and is now working on an online strategy as well. It has already announced that it is looking for a partnership with Amazon and Flipkart for online sales. It is also working on Flash sales (where limited stocks are put on online sales for a limited period of time for new launches) strategy to create a buzz around the brand. Oppo, which currently assembles phones at two plants in north India and is building a third facility, is also considering designing its devices in India. “The untapped demand in the lower-tier cities remains the key attraction for China-based brands to explore the growth trajectory in India. Their strength in their home market of China and weakening position of local players have helped some of these China-based players to solidify their operations in India,” says Jaipal Singh, Senior Market Analyst, IDC India. Samsung, which has been the market leader for four-and-a-half straight years, lost the top spot to Xiaomi in the smartphone space. According to CMR, Samsung had 23% market share, with Xiaomi leading the pack with 25% market share. However, Samsung contests that and claims to be No. 1 in the smartphone segment. It claims to have takers. According to actual sales figure as per GfK, it has 42% in the overall smartphone segment and 55% in the premium segment. In the premium segment, the South Korean conglomerate trailed at No. 3 with 22% share in the Rs.30,000-plus segment in the quarter to December 2017, compared to leader Apple’s 44% and No. 2 OnePlus’s 27%, as per data from Counterpoint Research. To arrest the decline in the market share, the South Korean tech giant is gearing up the expansion of smartphones range. In January, it launched two back-to-back handsets - Galaxy A8+ and Galaxy On7 Prime. The company will launch six to eight smartphones this year to continue the same legacy as introduced in 2017 with reasonable prices. Samsung has wider distribution network and product portfolio, which will come in handy for it to fight back. However, Samsung does need to do a lot more in the entry-level segment of smartphones and also needs to refresh its entire lineup with reasonable pricing to fend off competition. The company garnered revenues of Rs 34,000 crore in FY2016-17 showing a growth of 27% over the fiscal year. The firm is hopeful to do better in the current financial year and maintain its leadership position in the country. The huge acceptance of its latest wares - Galaxy S9 and S9+ - in the market, the company believes is a testimony to that. India is the world’s biggest feature phone market. The year 2017 witnessed a 17% annual growth in the feature phone market after declining for three consecutive years. While feature phones remain relevant to a large consumer base in India, the Indian telecom operator Reliance Jio shipped huge shipments of 4G-enabled feature phones taking the leadership position on its maiden quarter in this category. This resulted in a total of 164 million feature phone shipments in 2017 from 140 million a year ago. In 2017 Q4, vendors shipped a total of 56 million units, making it the highest-ever shipments in a single quarter. The category registered a huge 67% year-over-year (YoY) growth and 33% growth from the previous quarter. “The JioPhone disrupted the feature phone market, with a unique device handset that blurred the distinction between feature and smartphones. Priced like a feature phone, the Jio Phone offered 4G mobile data to customers. Shortly after its introduction, Jio Phone became the market leader in feature phones. 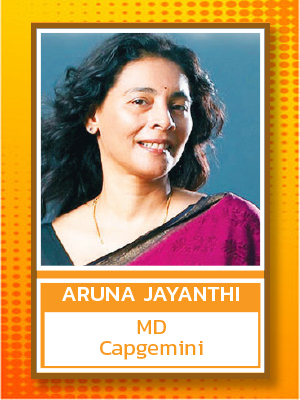 While Jio’s entry caught the incumbents by surprise and awe, it soon led to the revival of feature phones, giving a second lease of life to some brands,” says Prabhu Ram, Head – Industry Intelligence Group, CMR. HMD Global, the Finnish maker of Nokia-branded handsets, has been able to get a lot of buzz in the market with its relaunch of old Nokia phones with updated software and also with their new smartphone range. Within a short span of time, they have managed to garner close to 3% market share in India. It is shortly going to launch Android Go (which is special Android version of entry-level smartphones)-powered smartphone and 4G feature phone in the market and hopes to increase its market share to 5% in India. It has already launched Nokia 1 with Android Go Edition for under-Rs.5,500, and plans to launch Nokia 8110 4G feature phone in May. The company is also looking at partnering with telecom operators to offer bundled services as a means to push sales. The last one year has been particularly tough for Indian brands like Micromax, Lava, Karbonn and Intex with having mere 12.5% market share. And there seems to be no concrete strategy from any of these brands, except Micromax which at least seems to be trying. It recently tied with Shopx, which is a digital offline player for its expansion in tier-II cities. Shopx is a online platform which delivers through a network 49,000 small retailers (who sell their stock through Shopx) in 230 towns across 10 states in the South and West of India. Micromax also launched Bharat series of affordable smartphones with which it tasted some success and sold more than 3 million devices in about 6 months’ time during 2017. However, if there is an Indian technology firm that had made its mark in 2017, it has to be Smartron. This Hyderabad based firm that claims to be an integrated IoT firm has got its backing from cricket ace Sachin Tendulkar. The cricketer is strategic investor in the firm. The one and half year old firm has launched three smartphones and one hybrid notebook so far, and all of its products have got quite number of eyeballs. Unlike other Indian mobile phone vendors that primarily get there phones from China and sell them in India and have very little or no R&D focus, this firm seems to be focused more on research and development than sells. Its first phone t.Phone is design marvel and doesn’t resemble smartphones made by any of the Indian players. Besides smartphones and notebooks, the firm has also launched few IoT devices in 2017 that included t.Band - a health and fitness wearable and an electric and connected bicycle. Apple and Samsung have been dominating the premium segment of the Indian smartphone market for the past three years. The two brands have been under spotlight, with over 90% of the share under their belt. But a late entrant, OnePlus, is changing the dynamics of the above-Rs.30,000 price segment. OnePlus, which started in 2014 and had less than 10% market share till mid-2017, and according to data from Counterpoint Research, its volume share stood at 27% of the premium smartphones shipped to India in January while Apple held 44% and Samsung’s 22%. The year 2018 would see more disruptions in the market as compared to 2017. 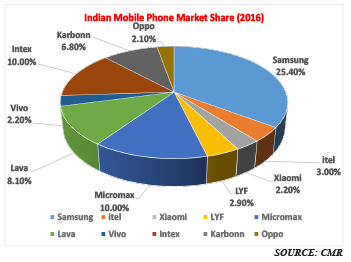 From a market perspective, one can expect a mass-scale consolidation in the Indian handset space. Many of the homegrown companies would shut shop or merge with each other. Unable to survive in the market owing to multiple factors like lack of innovation, “nothing-new-in-the-product”, lack of quality after-sales services, and disruptions from Jio, would force many to look for other business. 4G feature phones, like that of JioPhone, would play a substantial role in 2018. There are more than 500 million people in India who do not have a smartphone phone and are deprived of data services. While these people will throng to own a 4G feature phone, many of the current phone manufacturers would shift their focus to build a phone like JioPhone, or to better it.